Once again thanks to everyone who supported First State Flippers and Delaware pinball in 2018! Without you, none of this exists. As 2018 comes to a close, I wanted to get dates out to everyone as soon as possible for everything we have planned in 2019. Once again we will be holding 6 “Delaware Tour Events” that will end will the Delaware Tour Championship. Same stipulations will apply for 2019, meaning you must play in at least 3 “Tour Events” and finish the year inside the top 40 in order to qualify for the Tour Championship. In addition to those events we currently have 2 special events planned. The first is the February Flip Frenzy tournament which uses a different style of qualifying. 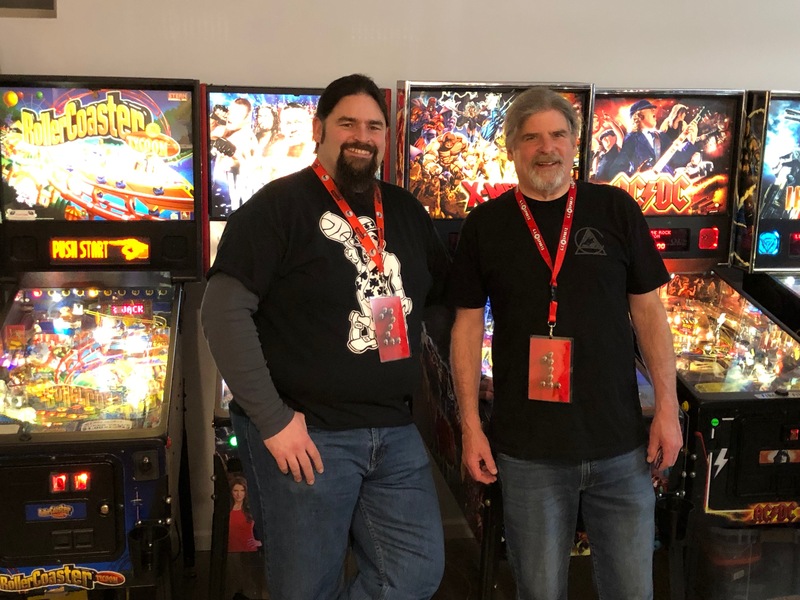 Basically it’s non-stop pinball action for 3 hours where you will play head to head pinball and will end up playing about 25 matches. At the end of the 3 hours of qualifying the top 8 will advance to the Finals. And then in October, First State Flippers is going to host Delaware’s first ever 24 hour pinball event. I expect this event to sell out fast, so stay tuned for the official announcement of when tickets will go on sale for this epic event! This is a just a brief overview of what we have in store for 2019. More details will be released in early January. Event #1 - IFPA SCS on 1/19 at Joe Fox’s House. Tournament starts at 12pm, doors open at 11am for practice. This is not part of the Tour Championship. Event #2 - February Flip Frenzy on 2/2 at Mike’s house. This is not part of the Tour Championship. Looking forward to seeing everyone in 2019! Thank you! First State Flippers. 158 likes · 73 talking about this. 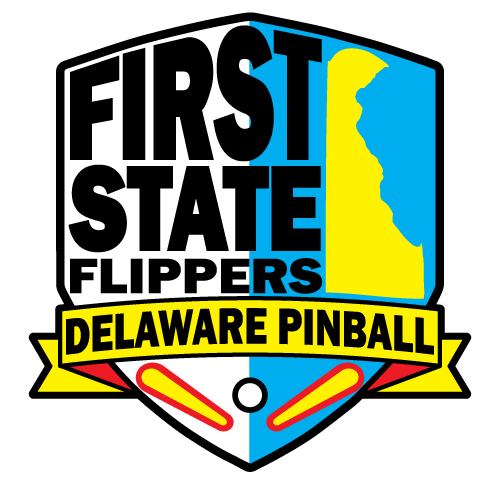 First State Flippers was created to help promote and to make pinball more prevalent in the State of Delaware. 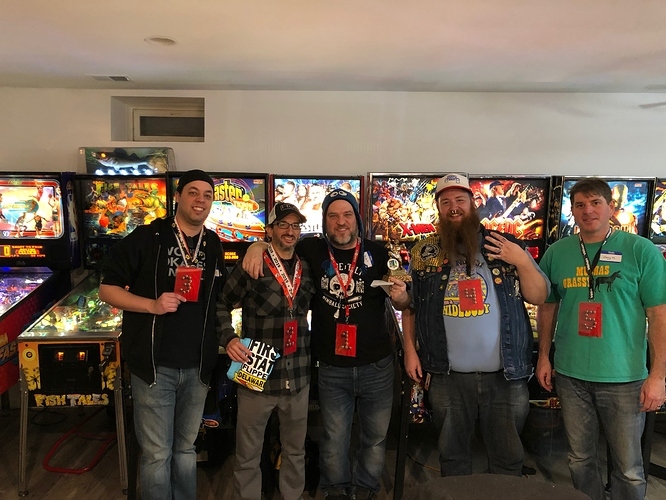 First year was good for Delaware pinball. We want to be even better in 2019! Hopefully you can make a few more events in 2019. Registration for our first official event of 2019 is now open! First State Flippers proudly presents February Flip Frenzy! Time: 12PM SHARP START TIME (games will go on at 10am for practice and will turn off at 11:45AM so we can start announcements). Qualifying will consist of 2 sessions. Session 1 will go from 12pm to 1:30pm, and then we will break for 15 minutes. Session 2 of qualifying will go from 1:45pm to 3:15pm(no games will start after 3:15PM). Finals will then start as close to 4pm as possible to give people more time to eat/regroup/practice. Finals: To be determined still. We will definitely have the top 8 moving on to the “A” finals, but still deciding on exact format as well as having multiple division finals. In the event that a registered player is late at the start of a match, that player will be moved to the end of the queue and will also receive a loss for that match. NOTE - THIS EVENT HAS SOLD OUT. SEE PLAYER LIST AND WAIT LIST BELOW. Thanks to everyone for their support! Quite a bit to cover in this email/post, but please take your time and read everything, especially the announcement regarding the open registration date & time for the 24-hour event being held on 10/19/19. First and foremost, Happy New Year to everyone! The survey results are in and are listed below. Thank you to everyone who filled out the survey, we appreciate your feedback. Cap the events? 50% voted to cap the events between 36-40 players, while 35% voted to have no cap. 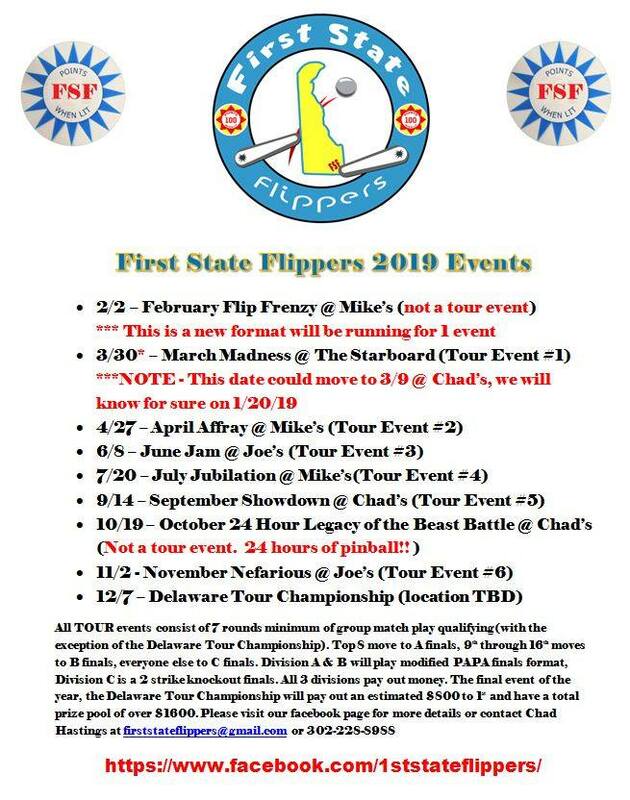 First State Flippers has decided that the “Tour Championship” events will be capped at 40 people. Other events like Flip Frenzy or the 24-hour event may use a different #. Trophies or plaques? 72% voted to keep trophies, 28% said plaques. 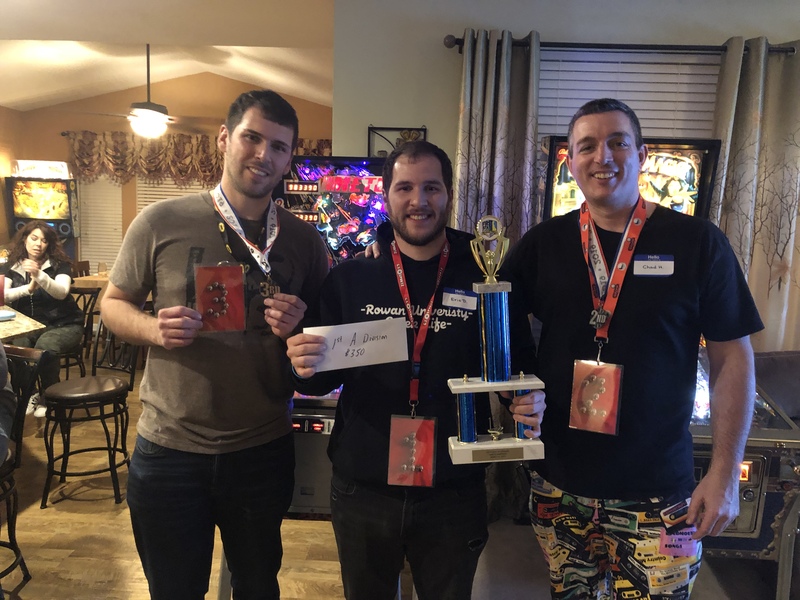 First State Flippers will continue handing out trophies, especially unique ones! Pizza or a variety of food? 58% voted pizza, and 42% voted variety. First State Flippers will leave the food choices up to the person hosting the event. General Feedback - I will just share a few of them. One person said keep making the relish dip. Another person said to allow “practice” during rounds. Another person suggested expanding the A/B divisions. Another person suggested trying a different format for the “tour championship”. And we also had numerous responses saying they enjoy the Delaware events and love how the events are run. First State Flippers will continue to make the relish dip. We will also continue to let players “practice” during rounds. We have decided to expand the “B” division to include places 9th through 24th along with a new finals format for the “B” division. We are undecided at this time as to what format will be used for the “tour championship”. Now on to the tournament information regarding the 24 hour event as well as the 6 “tour events”. On January the 20th, at 12pm eastern, open registration will go live for the 24-hour event being held on 10/19/19. I have had lots of people tell me they are highly interested in attending this event and I expect it to sell out pretty fast, so please make sure you set your alarms and reminders for 1/20 at 12pm! Below are the initial details we have ready at this time, full details should be ready once the event registration goes live on 1/20. The event registration process will be hosted by Eventbrite. I encourage everyone to go create an account now to help streamline the process, as you will have to create one during the ticketing process if you do not already have an account. Full Refunds, provided we can fill your spot, will be available until August 31st. 50% Refund after that until September 30th. 25% Refund until October 12th. No refunds after that. FULL DETAILS will be released on 1/20. Lastly, the 6 “tour championship” events will have open registration starting around 4pm on 1/20. More details for the “tour championship” events will be posted on 1/20 as well. Again, the First State Flippers is thankful for your support in making these events successful. We are excited for 2019 and looking forward to seeing everyone! A friendly reminder about the upcoming registration for the 24-hour event in Delaware. On January the 20th, at 12pm eastern, open registration will go live for the 24-hour event being held on 10/19/19. I have had lots of people tell me they are highly interested in attending this event and I expect it to sell out pretty fast, so please make sure you set your alarms and reminders for 1/20 at 12pm! Below are the initial details we have ready at this time, full details should be ready once the event registration goes live on 1/20. Also want to thank Rage Tilt Pinball for creating a new logo for First State Flippers! Thanks Rage! 14 tickets left. Better snap then up now before they are gone. Thanks for all the interest so far! PLEASE include the event name in your PayPal notes. NOTES - March event is now officially on 3/9. Also the April and July events start 1 hour early. PLEASE STOP SENDING DEPOSITS, ALL 6 TOUR EVENTS ARE SOLD OUT FOR 2019. 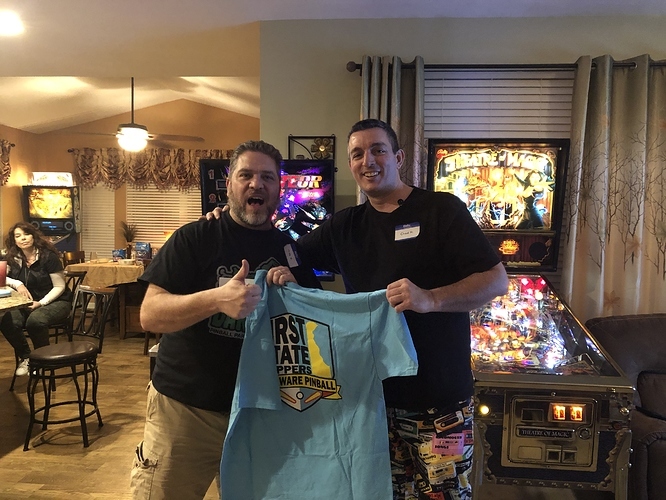 First, I’m totally humbled by the support and love that everyone is showing for First State Flippers and Delaware Pinball. Thank you, thank you, thank you for your support. I really didn’t think all the Tour events for the entire year would sell out in 3 hours. It’s crazy. In fact we over sold by quite a few spots, and we decided to move the CAP to 48 players just so we don’t have to turn away so many people. I’m still sorting things out in the order that I received PayPal payments, once I have it all sorted I will unfortunately have to refund about 3 people as it stands and put you on the wait lists. My apologies. Again, I had no idea they would sell out this fast. Thanks again! 1/24/19 UPDATE - Down to 2 tickets left for the 24-hour event. First State Flippers first ever Flip Frenzy is officially in the books. A big thanks goes out to all 42 people who attended the event! 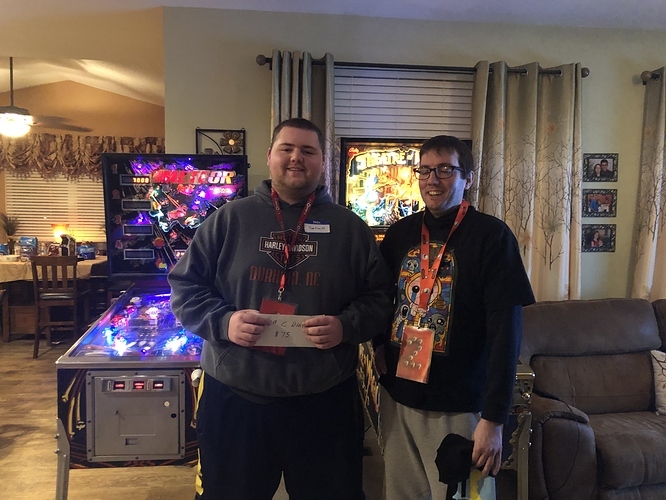 We also had 9 new people attend their first ever First State Flippers event, I hope all 9 of you had a great time and I hope to see you at future events! IFPA results have already been submitted and final overall standings are at the bottom. We held another 50/50 raffle drawing at this event taking in $155. Our winner was Nicholas Wahal and he took home a cool $78. The remaining $77 was dumped into the total prize fund package and divided up amongst all 9 payouts. Also, I want to make sure everyone that participates in a First State Flippers tournament is fully aware of the breakdown of the money received for the tournament. I want everything to be transparent. 42 entries brought in $1470. $210 was removed for expenses. $42 was removed for the IFPA fees. $118 was needed for trophies and prizes. That left us with $1100 to disperse to all the winners(not counting the 50/50 winnings). Congratulations to all of the winners as well!! Below is a list of the winners in each division. 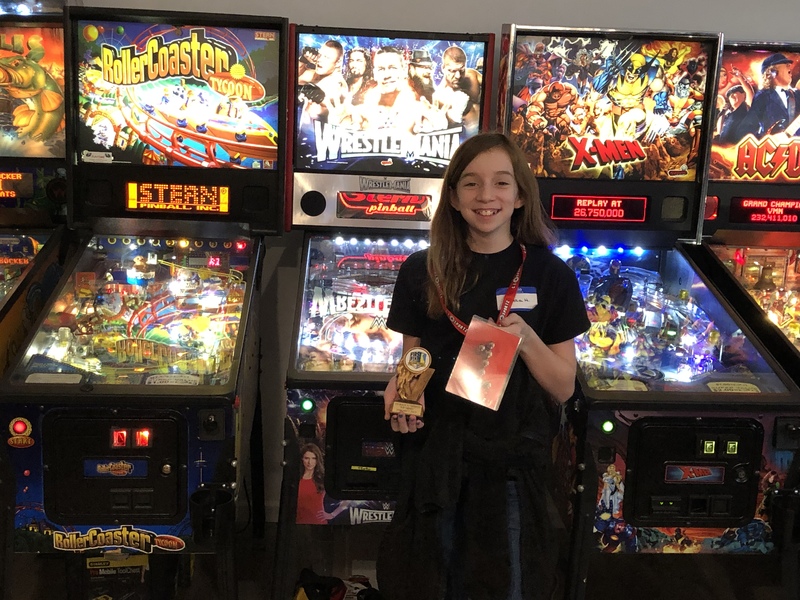 March Madness 2019 is now in the books! A big thanks goes out to all 48 players who attended yesterday’s event. Without your support these events don’t happen! I hope everyone had a blast yesterday. 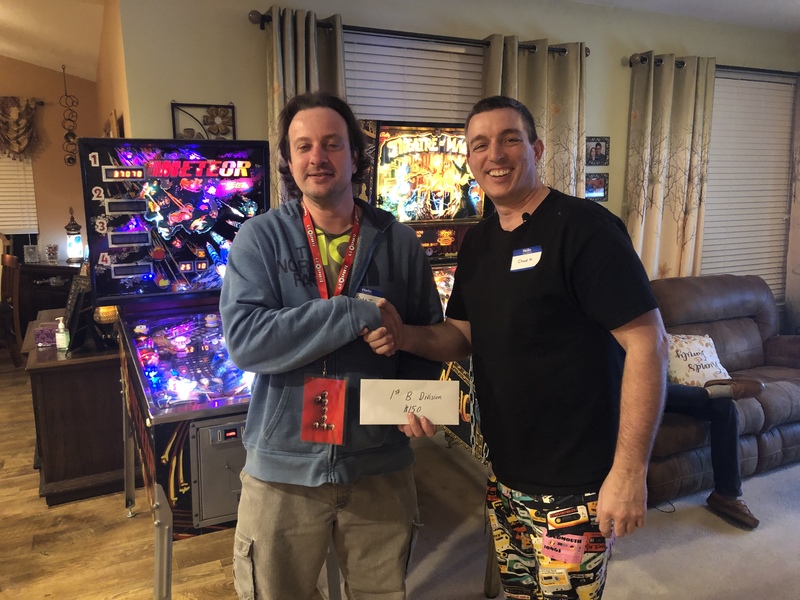 We also had a few new players attending their first, First State Flippers event and we always welcome them to our events. Hopefully everyone walks away with a positive experience and at the end of the day I want all of you to tell your friends and other pinheads that First State Flippers put on the best events ever because that is what we strive for! IFPA results will be submitted tomorrow due to some technical issues. After 1 event we raised $192 for the Tour Championship Prize Fund, and are 50/50 drawing was for $176, so $88 went to Mike Veith with winning ticket and the remaining $88 will go towards the Delaware SCS “sponsorship funds”. 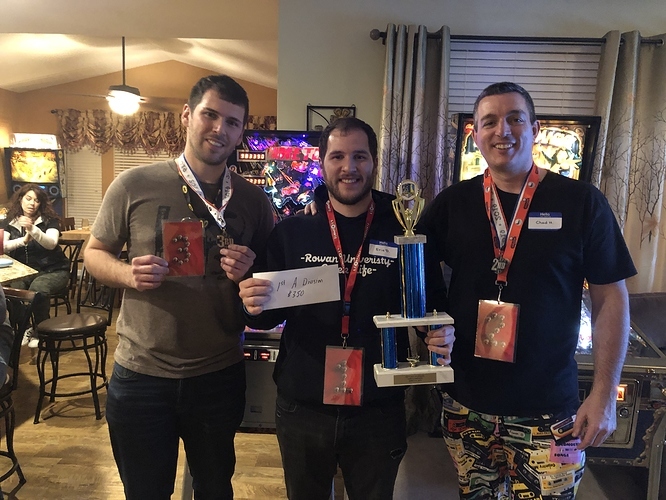 For our Bounty Envelopes, we had all 6 bounty envelopes collected by the end of round 4 and we gave out a total of $35 in bounties at this event! Next event is April Affray which is Tour Event #2 and it will be held at Mike V’s house. Please remember this event starts 1 hour earlier. 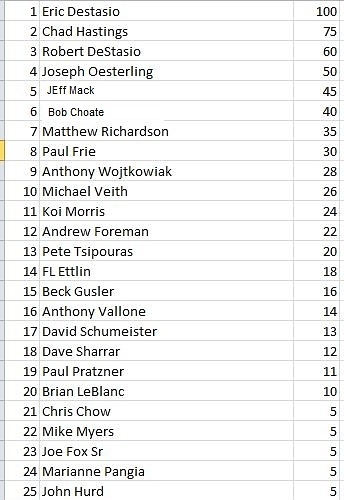 Below we have a recap of the winners, final overall results, and the current standings for the Delaware Tour Championship after 1 event.